In 2014, Michelle Di Tomaso was diagnosed with advanced breast cancer. It came as a shock to her because she had undergone four clear mammograms. She was devastated to learn that the tumour in her left breast had been growing for two to three years. She believes she might have caught it earlier if she knew one thing: she has dense breasts. But Di Tomaso didn’t discover that until after undergoing an ultrasound and a biopsy. “It was a camouflage effect, and they missed it. I said, ‘They missed it for three f–king years?’ And [the medical oncologist]’s like, ‘It happens,'” Di Tomaso recalled to White Coat, Black Art’s Dr. Brian Goldman. Following the discovery, she underwent rounds of chemotherapy and radiation, a double mastectomy and a raft of complications. Breast density has been known in the medical community for decades, but it’s still a relatively unknown issue to family doctors and patients, in part because physicians aren’t instructed to tell their patients about it. While fatty tissue appears as dark grey in a mammogram, dense tissue shows up as mostly white — just like cancers. In 2016, Di Tomaso co-founded Dense Breasts Canada, a non-profit group which raises awareness about breast density and lobbies to make it easier for patients to find out if they have dense breasts. “I want a woman to be told her breast density when she has a mammogram … If that woman has dense breasts, I want her to have an ultrasound,” she said. Despite the name, dense breasts don’t feel any different to the touch. Only a mammogram can identify whether someone’s breast tissue is denser than average. Dr. Paula Gordon, Dense Breasts Canada’s medical adviser, says she often sees women with dense breasts who have had their cancer missed by a mammogram. Gordon, who is the medical director of the Sadie Diamond Breast Program at B.C. Women’s Hospital, added that cancer is “four to six times more common” in women with the highest breast tissue density, but researchers don’t know why. In 1986, the BC Cancer Agency became the first provincial agency to do screening mammograms. 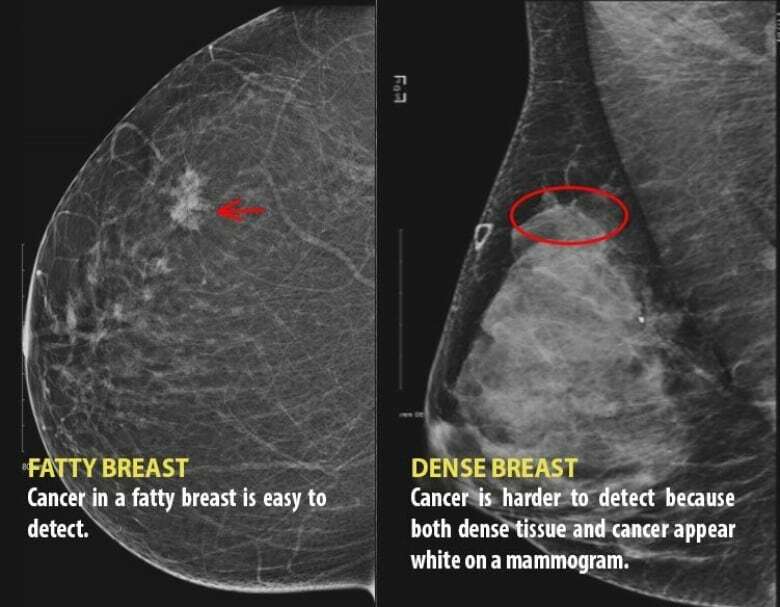 From the very beginning, radiologists were asked to indicate on each mammogram if the woman had dense breasts and so they did. But there wasn’t a directive to tell patients. “It’s like somebody having high blood pressure and not telling them. No family doctor would do that,” Gordon said. Di Tomaso was “very insulted” when she first heard that reasoning. That way women can find out sooner whether they have dense breasts. If they do, they can be screened with an alternative method, such as an ultrasound or MRI to check for potential cancers. Currently, the Canadian Task Force on Preventive Health Care recommends women have a mammogram every two years starting at age 50. Quebec is the only province that requires a woman’s breast density information be given to her family doctor. In other provinces, doctors might be given the info from a mammogram report, but they aren’t required to inform patients. In New Brunswick, where an election campaign is currently underway, both Liberal and Progressive Conservative leaders pledged to ensure women are notified of their breast density. The discussion there has been spearheaded by breast cancer survivor Kathy Kaufield, who has been promoting breast density awareness with her #TellMe social media campaign. In Prince Edward Island, Health PEI is planning to look at how and when patients are given breast density information as part of an upcoming review of their breast cancer screening program. Meanwhile, in the U.S., more than 30 states require doctors to tell women their breast density. Di Tomaso is encouraged by these small signs of change in Canada. To her, it may begin with a simple line of text on a mammogram report, but it can make the difference between life or death. “I just want women to know. I just didn’t want it to happen to anybody else,” she said.